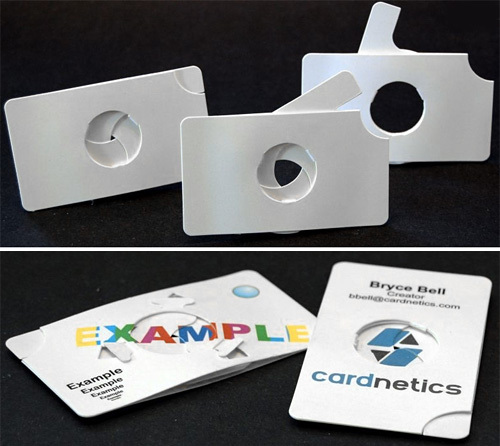 Iris Business Card Perfect For Photographers, Aperture Science Employees | OhGizmo! By Andrew Liszewski on 05/31/11 • Leave a comment! The business card is in desperate need of a digital makeover (as long as Flash and/or animations aren’t part of it) but until then the art of paper 3 1/2 x 2-inch cards with contact details printed on them will continue to evolve. And if you’re a photographer, or a developer of portal technology, you might want to consider these clever functional iris cards from Cardnetics. Using a lever on the side you can open and close the 3-blade mechanical iris, revealing a 1-inch hole on the inside. If you’re handy with a hobby knife or have access to a laser cutter you can download the patterns for the card from Thingiverse and make your own. But Cardnetics also offers a full color printing service if you order the cards pre-made from them, but they start at $6.50 a piece (2-sided color printing) with a sliding price scale the more you buy.